Charles Albert Jewelry Collection features Handcrafted, One-of-a-Kind Jewelry created with fossils, minerals, and gemstones set in fine sterling silver . Charles Albert Jewelry is a Bold Edgy Fashion Forward Trend Setting yet Timeless Jewelry Collection of Necklaces, Earrings, Pendants, Cuffs, Rings, Bracelets, Fashion Accessories and more. Charles Albert Jewelery is Elegant, Contemporary Jewelry that is wearable art and art inspired by nature! Charles Albert scours the globe to find the best in fossils, minerals and gemstones to set in his fine sterling jewelry. Using Amethyst from Brazil, Ammonites from Madagascar, Peru and Morocco, Obsidian from Mexico as well over 100's of other fascinating stones, Charles Albert Jewelry Boasts the widest variety of pendants, bracelets, rings and earrings available in the jewelry market today. Every single piece of Charles Albert Jewelry is meticulously handmade by the finest silversmiths in the world earning Charles Albert a reputation for producing exquisite quality jewelry art, ready to wear! 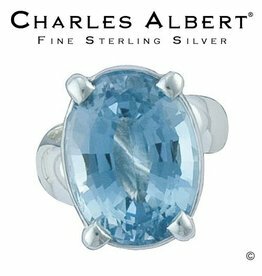 Experience and Shop Online the world of Charles Albert Jewelry Collections Today! Charles Albert Jewelry Rings Collection. Fine Sterling Designer Handcrafted Jewelry of Necklaces, Pendants, Cuffs, Rings, Bracelets and Fashion Accessories. Nature inspired contemporary wearable art jewelry by Charles Albert. Charles Albert Jewelry Rings Collection. Handcrafted in Fine Sterling Silver by Charles Albert. Fits sizes 5-11 - Adjustable Shank for easy sizing. 1 .25in. Geode: .75 x .45mm each estimated. Varies in size, shape and color. Size: 1.5 inches. Charles Albert Jewelry Pendants Collection. Fine Sterling Designer Handcrafted Jewelry of Necklaces, Pendants, Cuffs, Rings, Bracelets and Fashion Accessories. Nature inspired contemporary wearable art jewelry by Charles Albert.